Enjoy the slot at GoWin casino! Claim 50 Starburst extra spins now! Silly, explicit and very, very funny: that’s a combination that can never go wrong in any way that you use it. On top of that, it doesn’t get old either. You can watch Ted over and over again, and every time you watch the movie, that cute silly teddy bear Ted never fails to put you in a laughing fit. In this mobile slot, the developers had brought back the same Ted that we know, without changing a single thing. He still the same old unruly, loud and crazy teddy bear that smokes pot and swears all the time and I absolutely love it. Best part about all of this is, Ted is not all just show either. There is some serious cash to be won from the eleven (not a typo) unique features in this game! Oh, a crazy jackpot of £5,000 is also up for grabs in Ted. 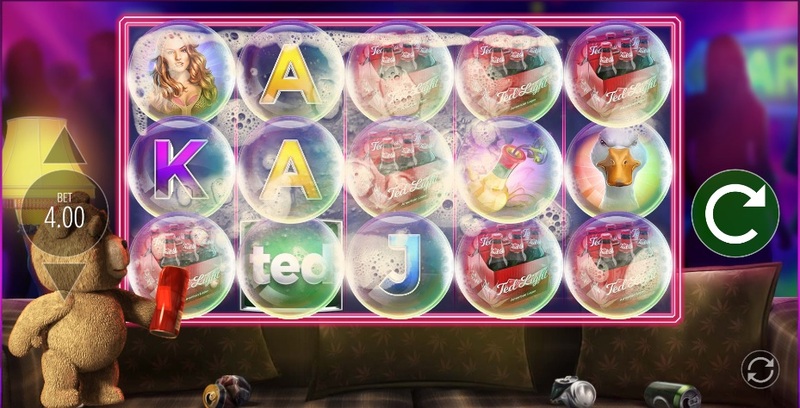 All the silliness come in the form of a five reel slot that is mated with 20 paylines. Ted is seen in his natural habitat – on his couch asleep after what looks like a drunken night. This mobile slot accepts a minimum wager of 20p and this goes all the way up to £200 per spin. Aside from the usual card symbols, you will find the more iconic characters and components from the movie, namely his girlfriend, some beer, and bongs among others. The symbol that you should be looking out for is the Ted symbol that comes stacked and can potentially pay you up to 25x your wager when you get five of them on your reels. Payouts wise, Ted grants its players decent amounts coupled with average frequencies. The Return to Player rate stands at 95.8% and in less than 10 minutes of playing we could tell that this slot is a medium variance slot. Maintaining your bank balance will not be an issue if you can trigger any one of the eleven bonus features in this game once in a while. As previously mentioned, Blueprint Gaming has also included a £5,000 jackpot to be won. Not bad for a teddy bear that only says and does silly things all the time! If I could rate Ted mobile slot in the performance department, without a doubt I would have given it a perfect 10. The graphics and animations throughout the game are on point and it’s as good as what you did see in the movie. The designers of this game did amazing job bringing every important element over and going mile further by engineering the bonus features around them. Even the soundtrack and the phrases that TED mutters out during the game are exact phrases from the movie. It goes hand in hand with the gameplay at all times. For instance, when you are waiting for that third scatter symbol on your reels to trigger the bonus features, Ted goes “come on, come on”. How cool is that? Rest assured, this slot will run smoothly on all your devices, including on laptop, mobile phones and tablets. I really liked the fact that I didn’t have to wait long for the game to load, even with all the sophisticated graphics, animations and features in this game. In short, the gaming experience is as good as it can get in this game. Game Features: Wilds, Win Multipliers, Extra Spins! Things get really interesting when Ted wakes up from his slumbered nap during the base game. Whenever he does think you are worthy of his time and wakes up, he may award you with any of the six following bonus features. Note that you will not need to get any symbols in order to trigger this feature as it is totally random. Psychedelic Colossal Spin – Once again, he picks up his Hookah and blows more smoke onto your reels making three of your reels combine to become a single colossal reel. The result? Colossal payouts everywhere! If you thought that Blueprint Gaming called it quits with the already impressive six unique bonus features in this slot, you are wrong. Everything about this slot is beyond ridiculous. I suppose the developers wanted to stick with the theme at hand. The next set of features in this slot is activated with at least three Thunder Buddies bonus symbol on your reels. Once triggered, you may be rewarded any of five features available by spinning a wheel. Here are the details of the five bonus features related to the Thunder Buddies symbol. Flash Extra Spins – This feature is played on a 5 X 4 reels with a set number of extra spins. As you play through the extra spins, the bonuses given to you will gradually get bigger. If you manage to reach the top of the grid of get any Flash symbols on your reels, you will be awarded with a super shot and with the Big Money Bonus feature respectively. Join Ted the teddy bear in his silly antics. You will be thoroughly entertained with the many bonus features in this game! Play the slot at GoWin now! Ted With the success that Ted has seen in summer 2012, Blueprint Gaming has brought back that same level of success back in this slot. Everything about this slot is just perfect. Even if I tried really hard to find a fault in this game, the only thing I can think of is that this game has too many bonus features. Even then, having too many features is never a bad thing. All the features in this game is something that you would find in the real movie and is an exact representation of the real character of Ted. For goodness sakes, even the phrases that Ted uses in this game are straight from the movie. At this point, I think that no words can do this game justice. In years playing and reviewing slots, Ted is definitely one of the best if not the best slot that I have played. Hands down, this is a five star slot and the best game released so far this year. PreviousPower Spins Casino Review — Extra Spins With Zero Wagering!